feature of your storage solution to fit any industrial setting or process. Endless combinations for the end result you need. Cabinet options that reach far, and wide. 23” to 58-1/4” to be exact. Your work starts from the ground up, but ours starts with the bottom drawer. Our drawers are equipped with stainless steel rivets for durability and an innovative handle design with a safety overlap that eliminates sharp edges. With 17 unique sizes and other accessory options, our drawers put everything within reach. See all custom drawer options here. Customize your workspace with flying colors. Our nine most popular drawer layouts shown below, for SW and SWP widths, NW width has less compartments and EWP and DW more. 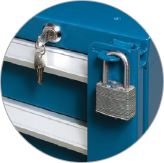 A padlock hasp provides extra protection of drawers and their contents. 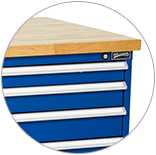 Anti-slip drawer liners help tools stay put while protecting the drawer’s interior. 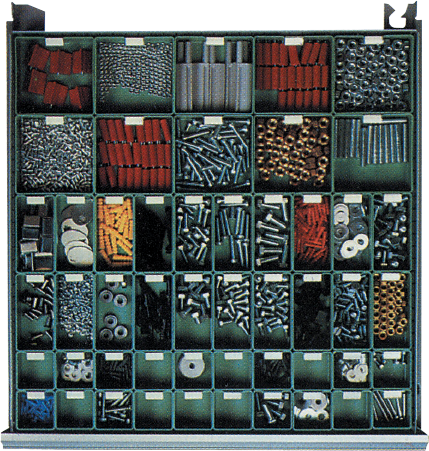 Plastic bins and grooved trays are designed to protect side-sensitive tools and keep your drawers organized. 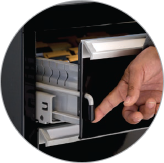 Divide drawers into front-to-back sections with powder-coated steel partitions. Lock individual drawers in place, either closed or fully extended. Recommended for truck or van storage. Our work surfaces are available in a variety of shapes and materials. 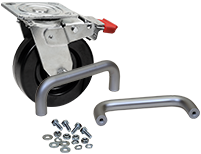 Make your storage mobile with our selection of handles and wheels. A tower of strength. Literally. 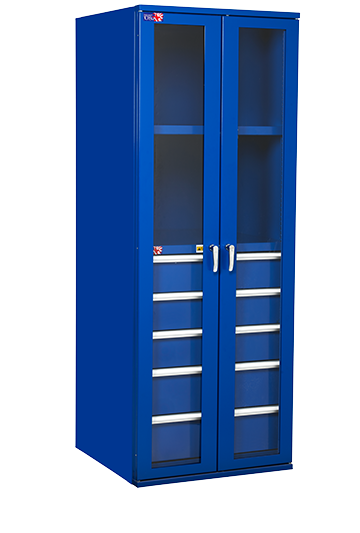 Designed and built specifically for industrial settings and systems that demand a storage solution as strong as the ones using it. 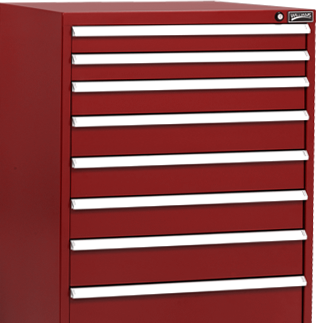 Heavy-duty steel construction for heavy-duty storage capacity of up to 400 pounds per drawer. Full MIG welding with surface ground on all eight corners, because your cabinet’s strong point should be all of them. Heavy-duty 11ga carriage with six ball bearing rollers and four steel rollers supports up to 400 pounds per drawer and ensures smooth operation with every push or pull. 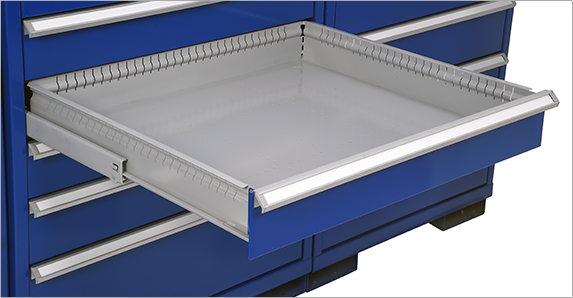 Double roller tracks allow for 100% drawer extension, which means full visibility and complete access to all drawer contents. 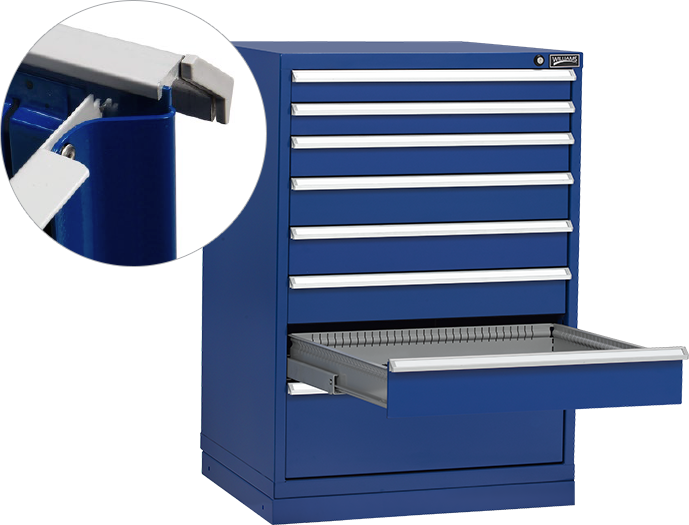 Stainless steel rivets on drawer fronts and handles provide 650 pounds of sheer strength per rivet for superior durability. Four or more rivets are used to fasten the drawer front to the body and the drawer pull to its front to create a stronger bond than screws can. That’s what we call tougher than nails. Advanced safety and security features are at the core of our design. Innovative handle design with safety overlap helps prevent injuries by eliminating sharp edges and softening pinch points. 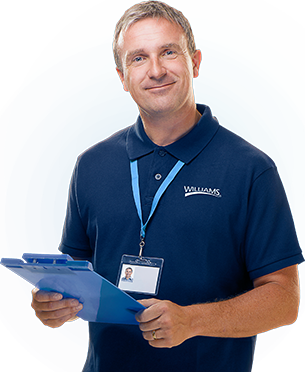 Safety isn’t just a feature, it’s part of our solution. 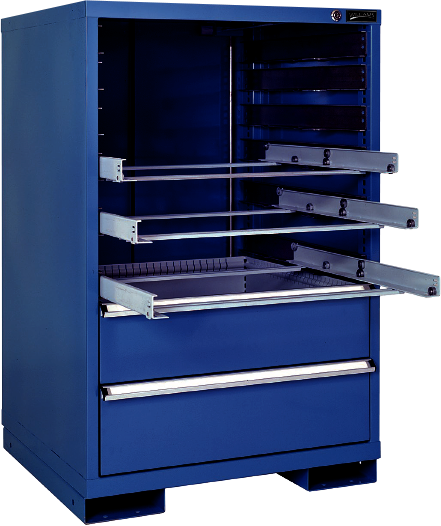 Full width 45-degree angle aluminum handles allow for better inventory control by aligning the outside drawer handle with the interior compartments and storage rows. Neutral gray drawer interior refracts the most light to the user, which means easier identification of drawer contents. Grab the tools you need and leave the ones you don’t. Heavy-duty 11ga plug-in guide rail allows for quick adjustments to accommodate different drawer sizes and arrangements. Full height sidewalls provide maximum cubic storage capacity while reducing inventory spillover into adjacent compartments. Keep tools in their place. Standard Wide Plus (SWP) Series at 32-½” wide is an exclusive cabinet size we offer, providing up to 22% more storage than our Standard Wide (SW) cabinets or competitors’ products. 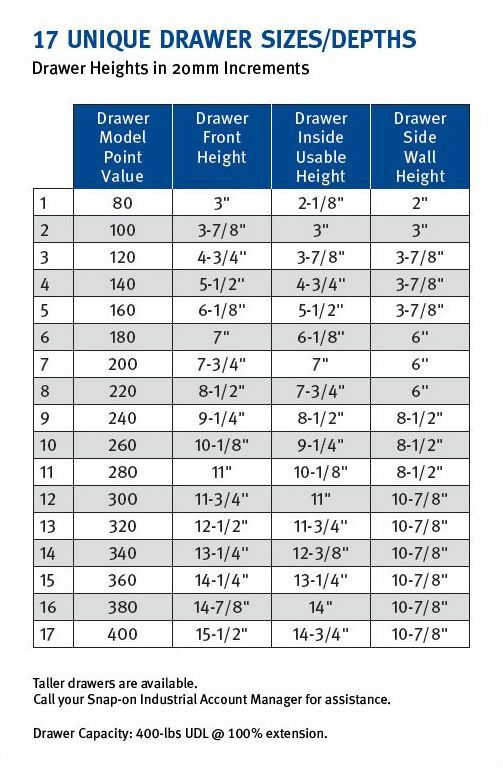 Take your storage capacity to greater heights or better yet, widths. Human-engineered drawers with 24-½” square sides were ergonomically designed to accommodate the reach of the average person from both the drawer’s front and side. The ability to pick stock or retrieve parts from the side helps keep aisles clear for better accessibility and productivity. Efficiency is now within reach. Organize bulky items by adding shelving storage to your cabinets. Their rugged, all-welded construction assures smooth operation, durability and years of dependable heavy-duty service. And because they’re adjustable, you can rearrange the shelves to flexibly adapt to your storage needs for years to come. 18-gauge shelf notched to fit snugly around upright posts, preventing small items from falling through any gaps to the shelf below. Powder-coat epoxy paint baked on to provide a high gloss finish. Shelf reinforcement adds an additional 400 lbs. of load capacity. Patented 11-gauge shelf support frames the system and supports heavy loads. Every workplace needs a place to work. 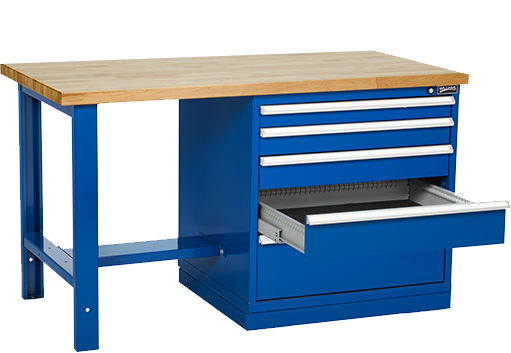 We deliver highly customizable workstations to fit your specific needs. They can be stationary or mobile, can have shelves, cabinets, or risers, and can be topped with a variety of work surfaces. You can even add footrests. With this much customization, you’ll be able to get the job done… your way. Fully welded and crafted out of heavy gauge steel. Supports up to 25,000 lbs. Riser shelves are available in steel (painted or stainless) or maple. Mobility workstations let you bring the work environment to the job, instead of going back and forth to and from the workstation. They’re called solutioneers for a reason. While you customize each element of your storage cabinet, we add the human one. You’ll work with a trained Snap-on Account Manager who can provide expert recommendations to create the best possible solution for your storage needs, and they can even visit your workplace to get a better understanding of how to maximize your space. How’s that for hands-on? Thank you for your interest. A member of our team will be contacting you.